Housekeeper job applications may require a covering letter so make sure that you are ready to write one. Check out our example below in this page however you will need to amend it as suitable before sending it to the employers. 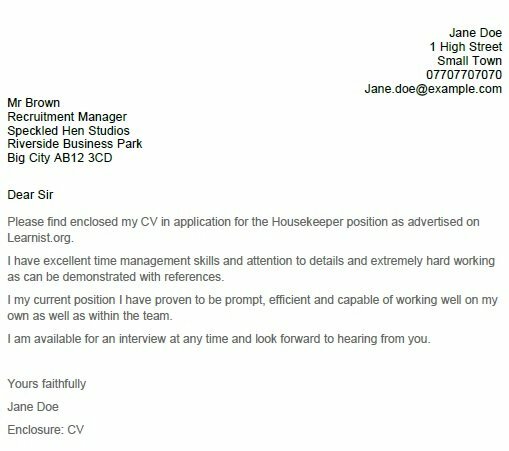 Please find enclosed my CV in application for the Housekeeper position as advertised on Learnist.org. I have excellent time management skills and attention to details and extremely hard working as can be demonstrated with references. I my current position I have proven to be prompt, efficient and capable of working well on my own as well as within the team. I am available for an interview at any time and look forward to hearing from you.